RecipeSavants.com Even the most finicky children will never guess that you sneaked spinach into these decadent muffins! 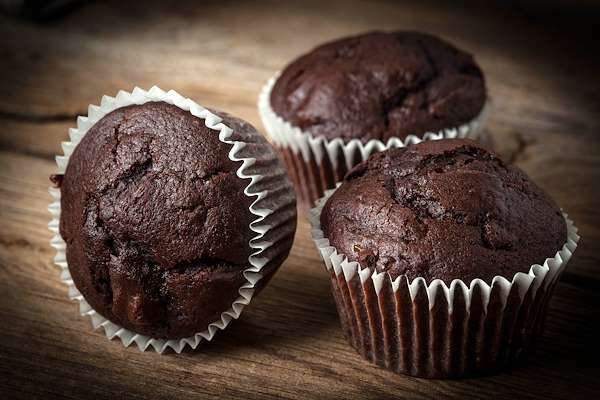 While they gleefully nosh on the chocolaty muffins that are loaded with banana and chocolate chips, they will not notice the boost of vitamins from the minced spinach. Who knew that spinach could taste so good? Smart Recipes, American Recipes, Vegetables Recipes, Recipes Vegetables American Chocolaty Spinach Muffins PT35M Serves 6 Ingredients: 1.5 Cups All-Purpose Flour 0.33 Cup Cocoa Powder 0.5 Cup Granulated Sugar 2 Teaspoons Baking Powder 0.5 Teaspoon Baking Soda 0.5 Teaspoon Salt 1 Egg 0.33 Cup Coconut Oil 0.5 Cup Milk 2 Cups Fresh Spinach 1 Banana 2 Teaspoons Vanilla Extract 0.5 Cup Chocolate Chips Preheat the oven to 350 degrees. Line a muffin tray with muffin cups and grease lightly with the cooking spray. Mix sugar, flour, baking powder, soda, cocoa powder and salt in a bowl. Whisk eggs with coconut oil, milk and vanilla extract. Add flour mixture to whisked eggs and mix well to combine. Fold in chocolate chips, banana, and minced spinach. Divide the batter into the muffin cups. Bake for 20 to 22 minutes. Cool completly at room temperature.